Western blot analysis of extracts from A431 cells, untreated or EGF-stimulated (100 ng/ml), using Phospho-EGF Receptor (Tyr1068) (1H12) Mouse mAb (upper) or EGF Receptor (C74B9) Rabbit mAb #2646 (lower). Phospho-EGF Receptor (Tyr1068) (1H12) Mouse mAb detects endogenous levels of EGF receptor only when phosphorylated at Tyr1068. 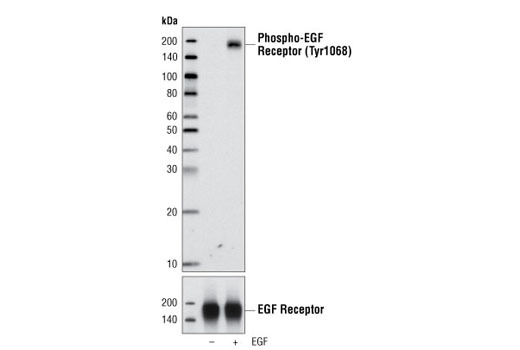 This antibody does not recognize EGF receptor phosphorylated at other sites, but may cross-react with other activated ErbB family members. Non-specific staining of smooth muscle may be observed in paraffin-embedded tissues.